Oxford Brookes University showcase their Formula Club-E project at the “Test Drive The Future” event organised by Oxford Council as part of the Low Carbon Oxford week. Oxford Brookes University (OBU), in partnership with one of the world’s largest racing car manufacturers, Dallara Automobili, is developing a mid-range electric racecar that features the latest technology, yet is fundamentally simple and provides an exciting racing experience for both drivers and spectators. Numerous additional motorsport partners are involved, including; Claytex, the BRSCC and YASA motors – with additional partnerships in the works. 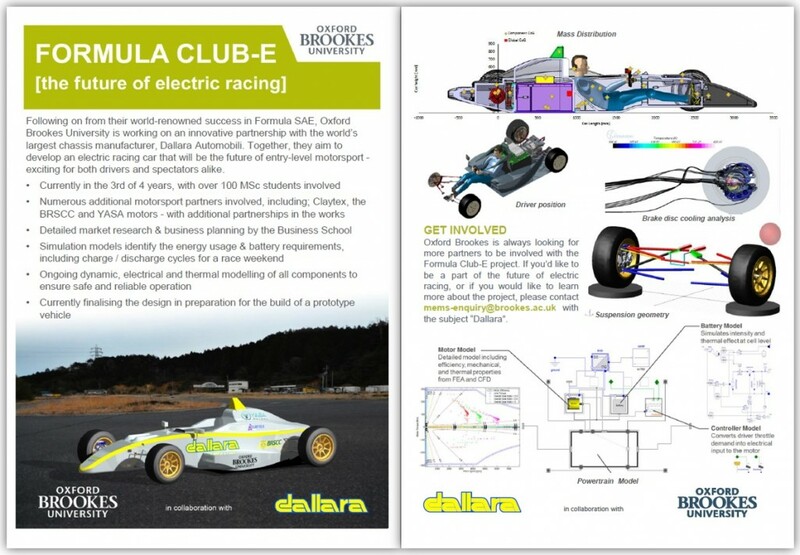 Oxford Brookes is always looking for more partners to be involved with the Formula Club-E project. If you’d like to be a part of the future of electric racing, or if you would like to learn more about the project, please contact mems-enquiry@brookes.ac.uk with the subject “Dallara”.